The China Desk: The following is an article published in the Manila Standard Today. The author, Victor N. Arches of San Juan City, is a retired investment and merchant banker, a retired Certified Public Accountant, and a retired economist who dabbles in history and political science. 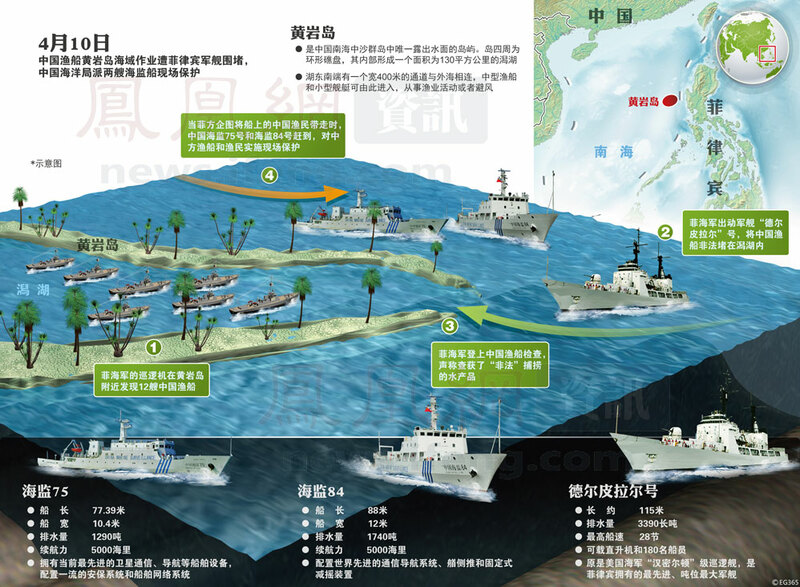 Arches correctly points out that at least within the framework of the conventional monopolistic state, Huangyan Island belongs to China. Free market anarchism, grounded correctly in individual ownership, would have prevented such clashes from arising in the first place. The Scarborough Shoal does belong to China which discovered it and drew it in a map as early as 1279 during the Yuan Dynasty. Chinese fishermen, from both the Mainland and Taiwan, have since used it. As a matter of fact, Guo Shoujing, (the Chinese astronomer, engineer and mathematician who worked under the Mongol ruler, Kublai Khan) performed surveying of the South China Sea, and the surveying point was the Scarborough Shoal which is considered part of the Zhongsha Islands (renamed Huangyan Island in 1983). By contrast, the “old maps” being relied upon by our Department of Foreign Affairs in its spurious claim on the same territory were drawn up only in 1820, or 541 years after China’s. I am surprised that Senator Edgardo Angara—supposedly a renowned lawyer—can claim that a map drawn 5 centuries and 4 decades after, takes precedence over the much earlier map of China. But I am all the more astonished that Fr. Joaquin Bernas, in his April 22 article in another newspaper, being one of the main framers of the 1987 Constitution, uses the 1982 UN Convention on the Law of the Sea as his basis to defend the Philippine claim. This, despite and after acknowledging the fact that, indeed, “the Scarborough Shoal is OUTSIDE THE LIMITS set by the Treaty of Paris for Philippine territory.” What kind of double-speak is that? So, what exactly was the territory we declared independence from the US in 1946? Why is it that NONE of our constitutions, past and present, from 1899, 1935, 1943, 1973, 1986 and 1987, include either the Spratlys or the Scarborough Shoal within our declared national territory? Where, or from whom, did we, all of a sudden, acquire title to these? Out of thin air? In the late 1970s, China organized many scientific expeditions in the Shoal and around that area. In fact, in 1980, a stone marker reading “South China Sea Scientific Expedition” was installed by China on the South Rock. This Chinese marker was removed, without authority, by the Philippines in 1997. All official maps published by the Philippines until the 1990s excluded both the Spratlys and Scarborough Shoal from its territorial boundaries. Our own Republic Act No. 3046, passed by our Congress and approved in 1961, stopped us from our claim. Yet, we had the temerity to amend this law on March 10, 2009, after 48 long years, to unilaterally include the disputed territories. But what takes the cake is the fact that China holds three international treaties in support of its claim over the territories in question—namely, the 1898 Treaty of Paris between the US and Spain, the 1900 Treaty of Washington between Spain and the US, and the 1930 Treaty between Great Britain and the US, all limiting Philippine territorial limits to the 118th degree meridian of longitude east of Greenwich. On the other hand, the basis of the Philippine claim is restricted to proximity, relying solely on the 1982 United Nations Convention on the Law of the Sea. As far as I know, a mere “convention” cannot overturn or supersede a treaty or an agreement reached between colonial powers. And even if it were considered a “law”, it cannot be made to take effect retroactively. hahaha this is stupid…i even remember in the news that a major TV station was looking for a certain Victor N. Arches II here in the Philippines for an interview but NO ONE KNEW such person exist in his stated residence.Also, they visited his past "employers", and no one knew him LOLLOL i wouldn't be surprised if a chinese nincompoop wrote that.